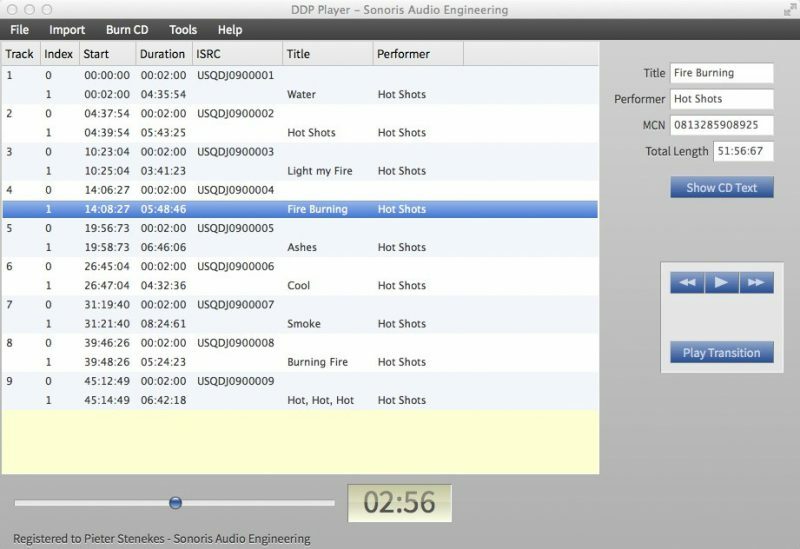 The Sonoris DDP Player OEM is a standalone cross-platform application that imports DDP 2.00 images and Cue Sheet (cue) files for playback or creating RedBook compatible audio CD’s. The OEM version has all features of the regular DDP Player, and is tailor made with your studio branding like a logo, name, address and website URL. 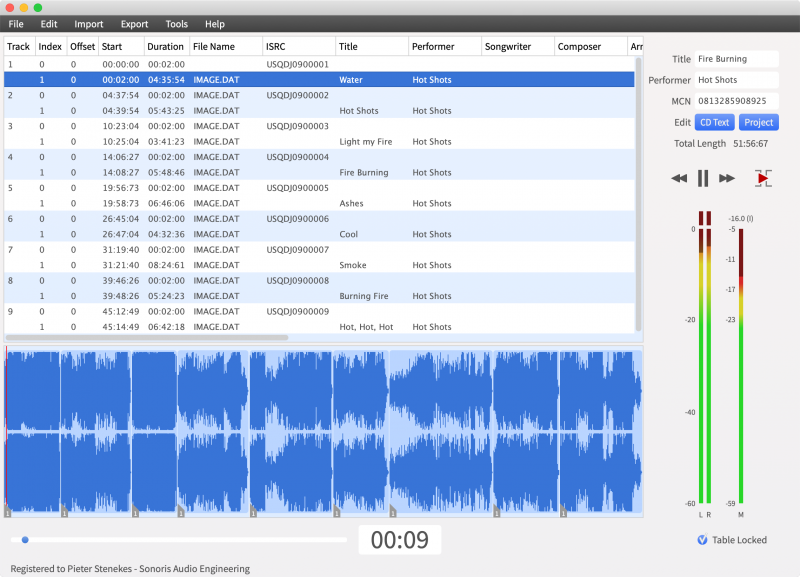 This OEM version of the DDP Player is designed as a tool for (online) mastering studios that want their clients to review or approve DDP masters and let them burn reference masters to CD. It allows you to send any number of copies freely to your customers. You can download the demo under ‘download’ on the top of this page. The software will open the test DDP image which you can download below. This should give you a good impression about how your customer will experience the DDP Player OEM. Besides a Windows and Mac version, an iOS version of the DDP Player OEM is included. The installation is simple, just point your customer to the free DDP Player app in the Apple App Store. The DDP Player for iOS supports DropBox for easy DDP file import. The Security Option is an optional add-on to the DDP Player OEM. With the Security Option is in use, your client will only be able to open your DDP images. It also allows encryption of DDP images and adds the option to restrict the CD burning and file extraction functions for clients. To build your DDP Player OEM we need some information from you. After we receive this information the software will be delivered by email within 24 hours, excluding weekends and holidays. You can always have us change the logo and other branding details later. Free of charge. The Sonoris DDP Player has allowed us to send reference files along to our clients that we know will sound as close to our Gateway CD references as possible. The Player is easy to use, adds efficiency to our workflow, and most importantly delivers a reference to our clients that we know will maintain the sonic integrity so important to what we do here at Gateway Mastering. Had the first success yesterday with a client 600 kilometers away approving a premaster within hours from finishing it here, using your software at both ends. We do like this “Internet” thing, especially in combination with such wonderful tools.